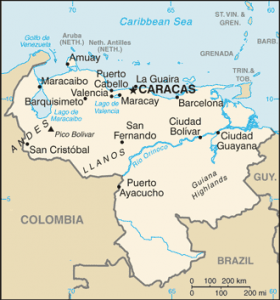 The Venezuelan Society of Public Health and the National Epidemiological Defence Network issued their sixth alert concerning diphtheria this week and now reports the disease is present in six Venezuelan states–Monagas, Sucre, Anzoátegui, Apure, Bolívar, and Miranda, including the capital city of Caracas, according to a Efecto Cocuyo report (computer translated). The report notes that the number of cases reported in September was 86; however, it has grown to somewhere between 200 and 300. The number must be taken with caution because it’s not known exactly how many confirmed cases and deaths there truly are due to the epidemiological silence in the country. The Venezuelan Society of Public Health says diphtheria was eradicated in Venezuela in the late 1940s.